← Our First Big Rescue of 2012 – Avonmouth and Beyond. 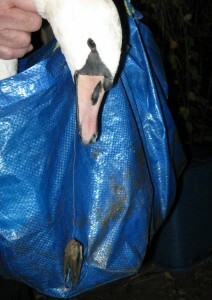 Once again, thank you to Steve for helping us out as it was getting dark (9/1) by going to Sevenoaks fishery to collect this young swan which was trailing a length of tangled line with a hook at the end of it. 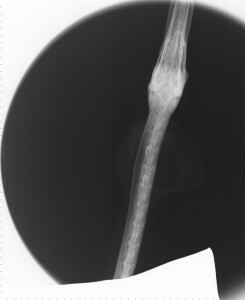 We believe its a young female, but even for a small bird, she is, in our opinion significantly underweight at barely 6 kg. While she is still somewhat subdued, at least she is eating well. Later in the week, it started to become apparent our bird was ailing – principally, she more or less stopped eating, and when we did check, she certainly had lost some of what little weight she had. Anyway, by Sunday (15th), it was clear we had to do something, and in this type of situation, ‘something’ is almost always a trip to the national Swan Sanctuary at Shepperton. This we did early on Monday – not always a good day to travel, but made especially worse on this occasion because the M4 was closed between Chippenham and Swindon, so an alternative route had to be found. Within minutes of arrival at Shepperton, an X-ray examination had been completed; this revealed two small hooks in the aesophagus 3 – 4 cms. apart. These were removed surgically later on Monday afternoon. One surprising outcome from this was the fact one of the hooks disintegrated completely as it was being removed. The swan is now doing well.